Well, this cake lied to me! 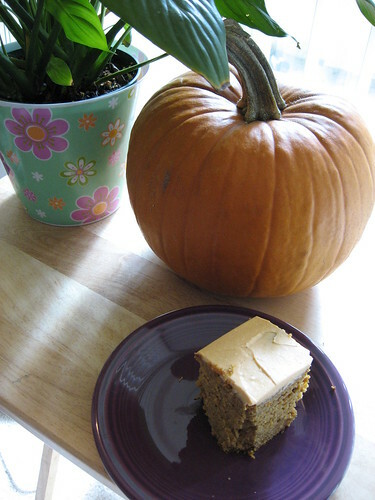 It claimed to be a pumpkin cake with honey frosting, but soon after I began working on it I grew skeptical. The batter was thick, even leveling it out in the pan was a little tricky. But as I tried my first bite it just seemed so familiar. I raced over to my recipe binder and began thumbing through the pumpkin recipes. It turns out this recipe is only one or two ingredients different from my favorite pumpkin BREAD recipe. This really is a quick bread with frosting. It’s very heavy and dense, so make sure you serve it in small squares! This would actually be an amazing treat to have with your coffee in the morning and would serve that purpose much better than having it after dinner when you’re already full. In fact, I found some incredibly cute photos from someone who used the original Martha Stewart recipe to bake mini cupcakes. Bite size is the way to go here. Beware the cook time. I used a square 8 inch pan because I don’t have a 9 inch, and I had a bit of a scare when I peeked into the oven at 55 minutes and the cake looked completely done. It had pulled away from the edges of the pan and was dark brown in the center and edges. I left it in for 5 more minutes but then became worried I was overcooking it. I did the knife test since I didn’t have any toothpicks, and it came out clean. But this time the knife lied to me. I poked at the center and it seemed a little squishy – it turns out the cake was like a pool that has a thick cover over it for the winter and I threw it back in the oven! To avoid this problem I would just try treating it like a bread and using a loaf pan (or, approximately 15 minutes for mini cupcakes and 25 for regular cupcakes). I also used pumpkin cream cheese for the frosting instead of regular cream cheese. This gives the cake and the frosting some nice continuity, and it worked well with the honey. And, woo hoo, you can make this recipe without any fancy gadgets – no stand mixers, food processors, pastry knives, etc. Dust off your whisk and wooden spoon! Preheat oven to 350 degrees. Butter your loaf pan. In a medium bowl, whisk together flour, baking soda, salt and pumpkin-pie spice. 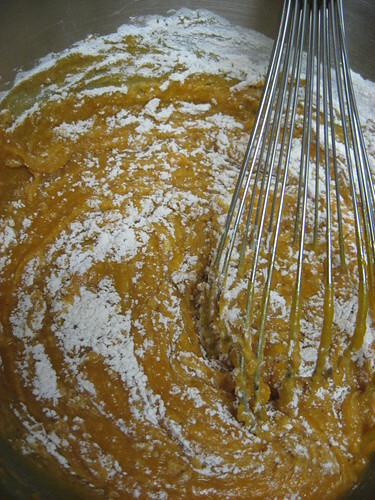 In a large bowl, whisk together eggs, sugar, butter (melted), and pumpkin puree until combined. Add the dry ingredients to pumpkin mixture and mix gently until smooth. Turn batter into prepared pan and level the top using a thin spatula. Bake until a toothpick inserted in center comes out clean, approximately 1 hour and 20 minutes. Cool for 10 minutes while in the pan, then turn out and cool completely (right side up) on a wire rack. To make the honey frosting – In a medium bowl, whisk softened butter, softened pumpkin cream cheese and honey until smooth and pale orange. 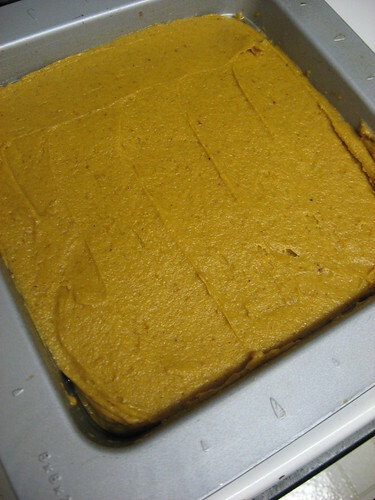 Spread over cooled pumpkin loaf. Cut loaf into sliced to serve. *If you prefer to use a square 9 inch pan, decrease baking time to approximately 50 minutes.